Designed to accommodation 4 couples in private cabins with ensuites, Whitsunday Blue is the ultimate way to see the Whitsunday Islands aboard a stylish catamaran. Enjoy a relaxing, stable journey across the Great Barrier Reef as your friendly host and professional skipper guide you around this magnificent region. 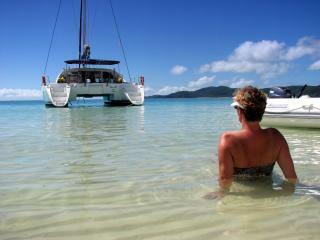 This 2 Day 2 Night Whitsundays Getaway is ideal for couples and honeymooners after a romantic way to take in the Whitsunday Islands onboard a stylish catamaran. Designed to accommodate four couples, the comfortable and intimate atmosphere is perfect for relaxing and enjoying the beauty of the Great Barrier Reef. Snorkel over coral reefs, swim in crystal clear blue water and enjoy the tranquility of sailing through these world famous islands. 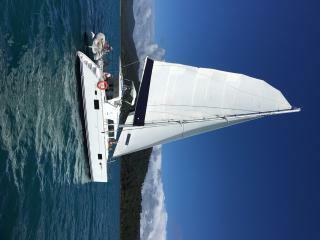 Cruise the Great Barrier Reef and Whitsunday Islands in luxury aboard this stylish catamaran. With only 8 passengers on board at any one time, you'll enjoy a friendly and intimate atmosphere as you stroll along the beaches, cruise the crystal waters and snorkel the colourful coral reefs.